Children are curious by nature, so it probably won’t come as a shock if you hear that your child has been asked by friends about the changes going on in your family. While children shouldn’t be ashamed to speak about their parents divorcing, when emotions are still raw and the separation is fresh, they simply may not want to talk about the changes their family is experiencing while at school. Maybe they’re worried they won’t be able to control their emotional reaction, afraid that they may cry or get angry at their friends. Whatever the reason, it’s important you give your child the tools to regain their confidence and be able to back away from an encounter they do not wish to have. It’s important for any parent to emphasize that having divorced or separated parents is nothing to be ashamed of, nor is it that uncommon. Many marriages and relationships end in divorce or separation, and your child probably has a friend or acquaintance whose parents are also no longer together. Knowing that their experience is not abnormal in any way can help them navigate encounters with kids at school who may be less aware of this fact. Conversations about the frequency of divorce in the United States may be uncomfortable at first. No parent wants to present their family as part of a statistic, but the more divorce and two-household families are presented as just another form of family, the easier it will be for your child to talk about their feelings surrounding your separation openly and without shame. Their classmates’ curiosity may not all be ill-intentioned, but any questions, no matter how innocent, may still cause your child discomfort. If your child is having a hard time responding to questions about your family’s situation, reassure your child that they don’t have to talk about it when and with whom they don’t want to. It may feel awkward for your child at first to refuse to answer a question, especially one asked by friends. But learning how to establish emotional boundaries between themselves and friends or acquaintances, particularly when breaching those boundaries causes them unneeded discomfort, is a lesson best learned early. If your child tells you that some of their classmates are pushing their interrogations too far, it may be necessary to involve your child’s teacher or school counselor. If another student at school is causing your child anxiety with incessant questions about your divorce, you should do everything possible to prevent that anxiety from growing into feelings of anxiety about school in general. Be sure to pay particular attention to when public probing becomes a form of bullying and immediately discuss options with school officials. With your child’s closest friends, you may want to consider reaching out to their parents directly. Preemptively contacting other parents to let them know about your divorce or separation may seem like an overshare, especially if you’re not close to the parents themselves. However, the parents whom you do tell will then have a better understanding of your child’s situation and know how to teach their own child to be sensitive during this difficult time. Your divorce may come as a new and confusing situation for your child but also for their closest friends who may have never experienced anything like it. Any child newly introduced to the topic of divorce will have questions about what divorce or separation ‘means.’ Parents should be the ones to provide those answers, instead of your child fielding those questions during school time. Other parents will also have the ability to teach sensitivity and empathy around tough topics. You can’t predict how your child will feel day by day about your separation. New emotions take time to process and can overwhelm children when they least expect it. Make sure your child knows about the resources available to them at their school, whether that’s their favorite teacher or school counselor. Many school counselors are trained in supporting children going through their parents’ divorce, so do not hesitate to inform them of the change in your relationship. If teachers and other school officials are aware, they’ll be better able to anticipate your child’s needs and know to look out for warning signs that your child is having a rough time. If your child does decide to talk about divorce with their peers, the reactions they receive will not always be perfect. Children who are still learning empathy may have upsetting reactions stemming from lack of knowledge, or they may simply parrot the negative stereotypes of divorce they’ve encountered. When your child tells you about these types of encounters, it’ll be important for you to counteract any harmful statements. Listen closely to the fears the reactions from their friends have brought up. Discuss these fears immediately without dismissing them, and be sure to check-in with your child about these fears in the future as well. 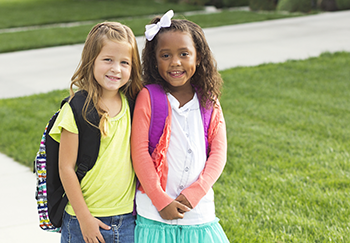 Returning to school after any big change can be daunting for kids. When a family has gone through a divorce or separation, children will be handling sometimes overwhelming emotions that may be hard to discuss with friends, especially in a public setting. To a great extent, parents can anticipate these issues and greatly lessen a child’s anxiety surrounding the new school year. By keeping lines of communication open between you and your child, introducing them to support resources at school, and reaching out to other parents, you’ll be laying the groundwork for a great school year for your child.